Brgy Villafranca Gigaquit, Surigao del Norte — When the women of this barangay were looking for ways to augment their husbands’ earnings, they hit on the idea of using their village’s foremost resource: nipa. “Nipa (Nypa fruticans) is a mangrove palm that thrives in coastal areas like Gigaquit. The plant offers numerous benefits, whether as source of food or protection,” said Lourdes Olais, chairperson of the Villafranca Women’s Association (ViWA). Olais said nipa palms are one of their sources of food and livelihood as it serves as a breeding ground for shrimp and some species of fish. She added that the palms also serve as a buffer crop which prevents soil erosion and provides breakers against strong winds and tides. Olais said their association had been considering nipa shingle production, not only because of its economic potential but also its manageability as a source of livelihood. “Our members, who are mostly housewives, don’t have a lot of time to engage in economic activities, while our elder members don’t have enough capability to go into farming,” she said. “We acknowledge the need to help augment our household incomes but we cannot totally abandon household chores, which are very demanding on our part. As housewives, we tend to our children’s needs while our husbands are busy earning a living, either through fishing or farming,” she said. So when the association was able to access funds from the Mindanao Rural Development Program (MRDP), ViWA members then agreed to venture into nipa shingle production after it considered the availability of raw materials. The MRDP is a special project of the Department of Agriculture (DA) jointly funded by the World Bank, the national government, and local government units. Livelihood projects are provided to small farmers and people’s organizations through the Community Fund for Agricultural Development (CFAD), the program’s livelihood portfolio. “The production of nipa shingles is simple and does not require special skills. The nipa’s compound leaves are simply cut from nipa trees. The small long leaflets are then removed from the stem or stalk. These leaves are folded over a bamboo stick of a convenient length and then sewed together with nipa midribs. After that, the shingle is ready for sale,” said ViWA treasurer Lucina Humunong. 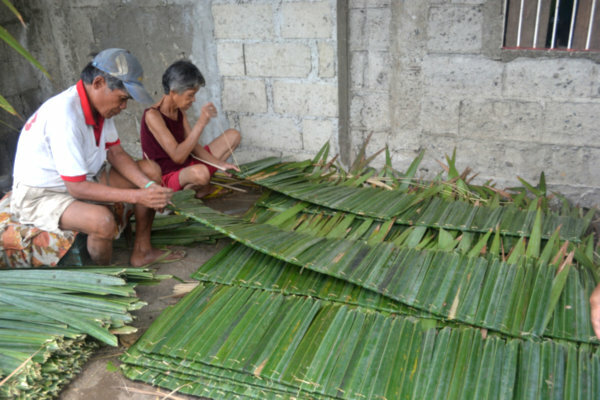 “Unlike farming or food processing, shingle production does not require long production time, so we just rely on volunteer magpapawod or weavers from our association. Each volunteer can produce 50-60 sheets of nipa shingles—just enough to make their spare time productive,” Humunong said. She said they sell nipa shingles at P450 per hundred sheets to local traders. The association grosses P4,500 a week out of the 1,000 sheets of nipa shingles they produce. Buyers regularly contact their association for a steady supply of nipa shingles. “What’s critical here is the steady supply, as buyers will look for other suppliers if we cannot keep up with their volume requirements. So we encourage our volunteers to produce more,” she said. Humunong shared that they are also planning to produce other products from nipa palms such as mats, hats, and other handicrafts to increase their association’s income. “Although our association’s income from nipa shingles is just about to pick up, it is inspiring to note that housewives and the elderly were given the chance to be productive,” she said. “CFAD caters to rural women and IPs to correct gender and culture biases among development projects. In agriculture sector, there is a need to develop livelihood projects that address the physical as well as the economic capabilities of rural women,” MRDP director Lealyn Ramos said. Ramos said the nipa shingle production project of ViWA is one example of a community-driven development in which rural-based organizations are given a chance to implement projects based on their identified needs. “The CDD procurement process is also observed to respond and adapt to a community mode of project implementation while at the same time ensuring consistency with the government and World Bank’s procurement guidelines,” said Ramos.